In 2006, I graduated college with a degree in Elementary Education. Since then, I have worked as a teacher's aide, a substitute, a Sunday School teacher, a youth group leader, an assistant basketball coach, an assistant choir leader, and countless other experiences with children and youth. 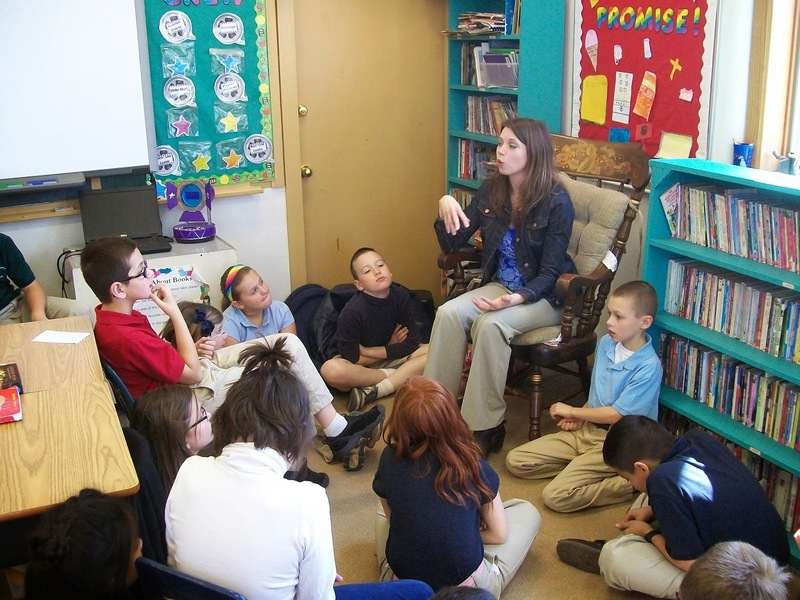 In my most recent history, I worked for five years as a classroom teacher for an inner-city charter school in downtown Fort Wayne. I loved it--all of it! But when you have a four year old boy and twin two year old girls, life as you know it changes forever. And I wouldn't change a thing. Throughout all my history of employment--from McDonalds to college alumni telemarketer (so to speak--I called alumni, asked their experience at said college, and then asked for money--I hated it) to classroom teacher, I have always lived in the moment. Relishing each experience and soaking up all it had to teach me. When I had kids, I loved being home with them. I cried when I went back to work. But ultimately, I was grateful to have employment--a break from the stress of being a new mommy. My coworkers were family to me, and I will always feel a strong bond to them, no matter where they relocate. But my 5th year of teaching, all this changed. I loved teaching. I loved the kids in my class--though some of them were a handful. I loved collaborating with other teachers and creating new units of study and hands-on activities. The thing I loved the most was the opportunity to write. I wrote all sorts of pieces--fiction, nonfiction, poetry, essays, fairytales, and stories with a lesson. I shared these pieces with my coworkers, and they shared it with their classes. The students were amazed that one of their teachers wrote these stories. I was grateful to offer something to our school. Because this is the truth. Though I was great with kids and teaching, I never felt the same fire I saw in the other teachers. I was missing something they had. Ambition. I didn't care about being the teacher of the year. When I found out my school was closing, I didn't feel despair or displaced. I was relieved. My heart broke for my coworkers and students, though. Our school had transformed into the most amazing educational experience I have ever been a part of, and I did not want to see it end. But as for me, I was ready to leave it all behind. And I've never felt like that before. It scared me. For once in my life, I didn't sit out and plan my life. I asked God to show me what to do. And deep inside me, he awakened a dream. A dream that had always been there. I just hadn't ever taken hold of it. In my previous post, I explained how I wrote CINDERFELLA and shared it with my class. They asked me if I was going to be a writer when the school closed. At the time, I had no idea. I didn't know what to say. I mumbled something about how you can be a teacher and a writer. But that was the day the dream took root inside me and began to grow. For the next eight months or so, my sole focus has been on writing a real, grownup novel. It went from 10 pages to 20k words to 40k words to 50k words. Now, it's 205 pages and 64k words and still growing. I've learned so much about writing from so many people. I'd be thrilled if I could write novels for the rest of my life. I'm already grateful to be home with my kids during the day and take one day a week to devote 5 hours of nonstop writing. I'm even willing to wake up before 6 a.m. (like today) and get in 2 hours of writing before my kids wake. But on Wednesday, April 16th, a new dream merged with my dream of writing/becoming a published author. That dream began with a friend of mine asking me to visit her class in the middle of the country in New Haven, Indiana. I walked into her spacious classroom, filled with 3rd and 4th graders. I was fairly invisible to them. They were lost in their reading and activities. But when I was introduced, they welcomed me with eager smiles. I sank into the familiar teacher rocking chair, while the students gathered around me in chairs and legs crisscrossed on the floor. As I engaged them in conversation about writing and publishing, inspiration and beloved books/movies, I fell in love. This type of interaction with students didn't require late night grading, early morning copying and planning, or conferences at dinner time. This was 30 minutes of connecting with the future writers of our world. I stirred their own dreams and answered their questions. And then came my favorite part. I read them the first two pages of SWORDS & CINDER. Their gazes were locked on my face. Not a word escaped their lips. And when I stopped, they simultaneously cried out, "No!" One asked me, "Is there more?" I laughed. Of course there's more. Another begged me to keep reading, but I told them, "My time is up, but look for me in two years. SWORDS & CINDER." They asked my name again, and I said, "Karen Mahara." After my 30 minutes, I received several hugs, a few words from other dream writers, and a slip of paper and pen thrust in my hand. A young boy with dark brown hair looked up at me and asked, "Can I have your autograph?" I almost cried. I almost cried the whole way home. I told God, "If this is what you have planned for my future, I couldn't be happier." So that's it--my dream--to write novels, be agented and published, to gain a passionate readership, and travel to schools telling my story and stirring other dreamers to do the same.